This board is fast and loose! Its design is extremely versatile and dependable in a wide variety of surf conditions. This model features a combination of single concave, double concave and a touch of vee out the tail for smooth rail to rail transitions. The rocker configuration and bottom contours allow instant acceleration, drive, and speed, The High Performance Shortboard maintains the maneuverability needed for radical directions, aerial and power surfing. This design continues to set the standard for cutting edge, performance surfing. 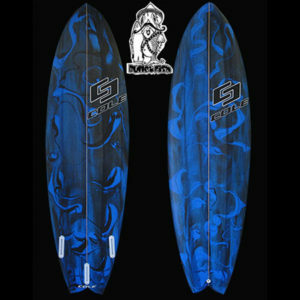 This model has been ridden by some of the world’s best professional surfers and has been tested and refined based on rider feedback.